Asia-Pacific’s waters are a veritable species soup! So, where do you start when you’re covering faceto- face encounters with the creatures of the most biologically diverse region in the world? Do you begin with the largest, the rarest, or the most flamboyant? Gilbert Woolley presents us with some of the top picks of the smorgasbord of subaquatic encounters on page 18, from meeting blue whales in Sri Lanka to seadragons in Indonesia. We go around the region with the photographers who are walking in off the beach and straight into the worlds of the outlandish, cryptic critters inhabiting Asia-Pacific’s near-shore waters (page 26). And we get speciesspecific with Richard Smith as he combs Australia’s unsung muck on page 34. But we are also facing up to some harsh realities. Madison Stewart, aka Shark Girl, has been fighting the good fight, documenting the devastating shark cull currently underway off the coast of Western Australia (page 46). And, with our world’s oceans and the creatures that inhabit them under increasing pressure, we find out where you can go for high-octane, once-in-a-lifetime encounters that also contribute to the preservation of these extraordinary animals and their habitats (page 40). One of the best things about putting all this together was being reminded of just how much biodiversity we have left that is worth protecting. And here they are, the charismatic creatures of Asia-Pacific, IN YOUR FACE! Asia-Pacific is home to the world’s greatest marine biodiversity, and some of the most charismatic aquatic animals. We journey around the region to find the best places to go for the most memorable meetings. Some of the most outlandish creatures in the ocean are living right off the beach. Professional underwater photographers let us in on their favourite shore dives for exciting encounters. One of Australian diving’s best kept secrets is its unsung muck – guaranteed to provide even the most experienced diver with new and exciting experiences meeting some of the rarest and most bizarre-looking fish in the sea. But only if you can spot them! How once-in-a-lifetime encounters with mantas, sharks, whales and orcas can help protect these giants of the sea, as well as the ecosystems they inhabit. Recording the tragedy of the shark cull taking place off the coast of Western Australia is acutely distressing, but raising awareness about this controversial policy is imperative for one of our oceans’ most passionate stewards. Madison Stewart goes face-to-face with tiger sharks in trouble. We talk to the dedicated underwater photographer, who is driven by his passion for the environment. 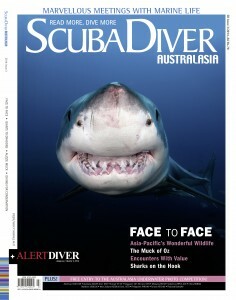 Find Alert Diver facing page 68, packed with essential information from the Divers Alert Network Asia-Pacific – the experts in dive safety, training and accident management.